The Arizona Diamondbacks are a professional baseball team based in Phoenix. They play in the West Division of Major League Baseball‘s National League. Since the team’s inception in 1998, they have played at Chase Field. Also known as the D-Backs, Arizona has one World Series title, in 2001, becoming the fastest expansion team in the majors to win a championship, doing it in only the fourth season since their expansion in 1998. Baseball had a rich tradition in Arizona long before talk of bringing a big-league team even started. The state has been a frequent spring training site since 1946. With a large number of people relocating to the state from the Midwest and the Northeast, as well as from California, many teams (most notably the Chicago Cubs, Chicago White Sox, New York Yankees, New York Mets, and the Los Angeles Dodgers) have normally had large followings in Arizona. Since their debut, the Diamondbacks have won five National League West titles, one National League Championship pennant and the 2001 World Series. The Diamondbacks’ original colors were purple, black, turquoise and copper. Their first logo was an italicized block letter “A” with a diamond pattern and a snake’s tongue. Prior to their inaugural season, they released their baseball caps. The home cap had a cream color crown with a purple visor and button. The road cap was black and had a turquoise visor and button. Their alternate cap had a turquoise crown with a purple visor and button. Depending on the cap, the “A” logo on the front of the cap had different color variations. In the Diamondbacks second season, they introduced a new logo which was a copper color snake in the shape of a letter “D”. It was used on a solid black cap, which in the beginning, was worn as a road cap. The franchise unveiled new uniforms and colors of Sedona Red, Sonoran Sand and black on November 8, 2006. The red shade is named for the sandstone canyon at Red Rock State Park near Sedona, while the beige (sand) shade is named for the Sonoran Desert. A sleeve patch was added featuring a lowercase “d” and “b” configured to look like a snake’s head. The team also kept the “D” logo, but was slightly altered and put on an all red cap to be used as their game cap. They also kept the “A” logo with the new colors applied to it, with a solid black cap used as the alternate cap. The primary television play-by-play voice for the team’s first nine seasons of play was Thom Brennaman, who also broadcasts baseball and college football games nationally for Fox Television. Brennaman was the TV announcer for the Chicago Cubs and Cincinnati Reds (along with his father Marty Brennaman) before being hired by Diamondbacks founder Jerry Colangelo in 1996, two years before the team would begin play. In October 2006, Brennaman left the Diamondbacks to call games with his father for the Reds beginning in 2007, signing a four-year deal (his FOX duties remained unchanged). The English language flagship radio station is KTAR. Greg Schulte is the regular radio play-by-play voice, a 25-year veteran of sports radio in the Phoenix market, also well known for his previous work on Phoenix Suns, Arizona Cardinals and Arizona State University (ASU) broadcasts. Jeff Munn is a backup radio play-by-play announcer; he served as the regular public address announcer at Chase Field in the early days of the franchise. He is well-known to many Phoenix area sports fans, having also served as the public address announcer for the Suns at America West Arena (now US Airways Center) in the 1990s. He is also the play-by-play radio voice for ASU women’s basketball. On November 1, 2006, the team announced that the TV voice of the Milwaukee Brewers since 2002, Daron Sutton, would be hired as the Diamondbacks primary TV play-by-play voice. Sutton was signed to a five-year contract with a team option for three more years. Sutton is considered one of the best of the younger generation of baseball broadcasters. His signature chants include “lets get some runs” when the D’Backs trail in late innings. Sutton’s father is Hall of Fame pitcher and current Atlanta Braves broadcaster Don Sutton. Former Diamondback and Chicago Cub Mark Grace and former Major League knuckleball pitcher Tom Candiotti were the Diamondbacks primary color analysts for the 2006 and 2007 seasons. Former Diamondback player Matt Williams also does color commentary on occasion, as does former Cardinals and NBC broadcast legend Joe Garagiola, Sr., a longtime Phoenix-area resident and father of Joe Garagiola, Jr., the first GM of the Diamondbacks (as head of the Maricopa County Sports Authority in the early 1990s, Garagiola, Jr. was one of the primary people involved in Phoenix obtaining a Major League Baseball franchise). The Diamondbacks announced in July 2007 that for the 2008 season, all regionally broadcast Diamondback TV games will be shown exclusively on Fox Sports Arizona; and a few could possibly be shown on the national MLB on Fox telecasts. Fox Sports Arizona (or FSArizona) is currently seen in 2.8 million households in Arizona & New Mexico. The previous flagship station, since the inaugural 1998 season, was KTVK, a popular over-the-air independent station in Phoenix. From 2009 to 2012, Mark Grace and Daron Sutton were tagged as the main broadcasters of the Diamondbacks with pre-game and post-game shows on FSArizona, being hosted by former big-league closer Joe Borowski. On June 21, 2012, Daron Sutton was suspended indefinitely, amidst rumors of insubordination. Then on August 24, the team announced that Mark Grace had requested an indefinite leave of absence after being arrested for his second DUI in less than two years. (Grace was later indicted on four DUI counts) For the remainder of the 2012 season, Sutton was replaced by Greg Schulte (Jeff Munn replaced Schulte on the radio broadcast) and Grace was replaced by Luis Gonzalez. At the end of the 2012 season, the team announced that neither Sutton nor Grace would be returning for the 2013 season. On October 18, 2012, the team announced that Bob Brenly would be returning as a broadcaster, and that he would be joined by then-ESPN personality Steve Berthiaume. The flagship Spanish language radio station is AM 710 with Miguel Quintana, Richard Saenz and Oscar Soria. Games were televised in Spanish on KPHE-LP—with Oscar Soria and Jerry Romo as the announcers—but this arrangement ended prior to the 2009 season due to the team switching fully to Fox Sports Arizona and the lack of carriage of KHPE-LP on the Cox cable system. Names in bold received the award based on their work as Diamondbacks broadcasters. 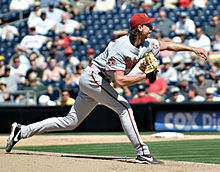 Randy Johnson pitching for the Arizona Diamondbacks. all stats as of 11/8/2012 from the Arizona Diamondbacks website. On June 23, 2010, the Diamondbacks announced that the team would retire its first jersey number by honoring Luis Gonzalez. Gonzalez played with the Diamondbacks for eight seasons, 1999 to 2006, attended five All-Star games representing the team and had the game-winning hit to win the first World Series in franchise history. His number, #20, was retired in a pre-game ceremony which was held at Chase Field on August 7, 2010 in front of a sellout crowd of 48,946. After the ceremony, the Diamondbacks won the game against the San Diego Padres 6–5 after a walk-off home run by Chris Young, who also led the game off with a home run in the Bottom of the First Inning. ^ a b c “D-backs shed their skin after unveiling new uniforms, colors on runway,” Arizona Diamondbacks press release, Wednesday, November 8, 2006. ^ “MLB.com”. Arizona.diamondbacks.mlb.com. Retrieved September 7, 2010. ^ “FSN Arizona to become exclusive TV home for the D’Backs starting next season | Dbacks.com: Official Info”. Arizona.diamondbacks.mlb.com. Retrieved September 7, 2010. ^ Piecoro, Nick. “Arizona Diamondbacks SS Stephen Drew’s ankle holds up”. azcentral.com. Retrieved November 9, 2012. ^ Boivin, Paola. “Arizona Diamondbacks hit hard again in the public eye”. azcentral. Retrieved November 9, 2012. ^ Merrill, Laurie. “Mark Grace indicted on 4 DUI counts”. The Republic. azcentral.com. Retrieved November 9, 2012. ^ Marotta, Vince. “Daron Sutton, Mark Grace out as Arizona Diamondbacks broadcasters”. Arizona Sports. arizonasports.com. Retrieved November 9, 2012. ^ Piecoro, Nick. “Arizona Diamondbacks name Steve Berthiaume, Bob Brenly as TV announcing team”. azcentral sports. azcentral.com. Retrieved November 9, 2012. ^ Piecoro, Nick (January 22, 2009). “No Spanish TV broadcasts for D’Backs”. Azcentral.com. Retrieved September 7, 2010. ^ Pentis, Andrew (June 23, 2010). “D’Backs to retire Gonzo’s number Aug. 7″. MLB.com. ^ Williams, Cory (June 23, 2010). “Diamondbacks To Honor Luis Gonzalez, Retire No. 20″. SBNation Arizona. Archived from the original on June 28, 2010. Retrieved June 24, 2010. This article uses material from the Wikipedia article Arizona Diamondbacks, which is released under the Creative Commons Attribution-Share-Alike License 3.0.